We have arrived! We left Charlotte at about 6:00 on Friday night and flew all night long to arrive in Santa Cruz, Bolivia on Saturday morning. Normally we have a one-hour layover in La Paz, Bolivia where we don’t leave the plane but sit and wait in our seats as the plane is cleaned and passengers leave and new passengers join us for the flight from La Paz to Santa Cruz. Yesterday, as we were approaching the runway, visibility was horrible. The pilot shot the approach and had to climb back up and try it again. A low-lying fog made landing impossible. After two attempts, he had to stop attempting to land and divert to another location, which happened to be Santa Cruz. While we were sorry for the other passengers who all had to find a flight back to La Paz, we were thrilled for us as it meant we arrived in Santa Cruz about an hour and a half earlier than we normally would have. It also meant missing that one-hour on the ground in La Paz. The La Paz airport is at 13,000 feet. When we do land there and spend one hour on the ground at that altitude, we can quickly feel the effects of that altitude and there are usually several team members with headaches and a bit of altitude sickness, even in that short time period. What an extra blessing it was that we missed that one hour of feeling the altitude and were able to arrive at our destination an hour and a half early. It was a wonderful little gift to start out our trip. When we arrived in Santa Cruz, we also made it through immigration and customs easily. With 13 people and 24 checked bags, we were beyond blessed when every bag arrived and only one person had to have their bag searched. This is significant as we brought several tools with us, a big supply of vitamins, and medications in our checked bags. The only bags that were searched were those of Robbie Kidd. Robbie happened to have the socket wrench set in one of his bags that we had brought with us. Apparently socket wrenches aren’t something people see here very often as I think Robbie spent more time trying to explain how to use it than explaining why he had it. Still, we made it out of customs with virtually no problems and were met by Pastor Ruben and Pastor Isabelle outside the terminal. What a joy it is to see them again. It always feels like a homecoming of sorts as we reconnect with friends that have become an extension of our Lakeshore family. We loaded up the team bus for the week and went straight to the hotel where they had held breakfast for us. After a quick breakfast, we got into our rooms and unpacked and organized the team suitcases, dividing up the tools and all of the medical supplies we had brought with us. We got organized and then headed to the store to purchase water for our hotel rooms. We only use bottled water to brush our teeth so we needed a supply for each person in their rooms. Once we were all settled, we actually got to rest for a couple of hours. In the words of Pastor Gil, those hours were transformative. Getting to sleep even a little bit after being in an airplane all night is a special gift. That extra hour and a half we got from missing our La Paz connection meant we actually got to have a couple of hours of uninterrupted sleep yesterday afternoon. Those naps made a huge difference in how each person on the team felt. We were so grateful. In the afternoon, we got showered and got dressed for church and then went to an early dinner. Pastor Roberts was extremely excited because we went to the one place we know in Santa Cruz that serves tacos. Pastor Robert was a little disheartened when he learned before we left that Bolivian food is different from Mexican food. He was happy last night to have one last bit of Mexican food before his week without tacos. We laugh because, with a last name like Rosales, many assume Pastor Robert can speak Spanish. As it turns out, Pastor Robert’s Spanish is limited to what he can order at a Mexican restaurant. He is an expert at ordering tres tacos de carne asados con todo para aqui. He did excellently ordering his dinner last night at the restaurant! After dinner, we headed to the church for their young adult service. We love this service as it is full of life and a big portion of the congregation are in their teens and twenties and come to this service. A few months ago, Robbie Kidd received a word to preach last night. As he prepared for the trip, God confirmed again and again that he should speak this word to the young adults. He did a great job and at the end he gave an invitation for salvation. There were several first time visitors and, at the end of the service, Jim, our translator for the trip, told everyone that if they wanted to accept Christ, they could talk with him after the service. At the end, two of the first time visitors approached Jim and accepted Christ last night. Come on! What a special gift from the Lord that we are able to be a part of that precious harvest. While at the church, Pastor Isabel, Pastor Ruben’s wife, asked me to come upstairs to her church office. I went upstairs and, there in the office, was Pastor Alejandra. She is the precious daughter of Pastor Ruben and Pastor Isabel. Last year, she shared with us some medical issues she was having, specifically with her reproductive health. Doctors gave her some grave news and told her that her ability to have children would possibly be jeopardized because of a surgery she needed to remove a mass in her uterus. Last year we laid hands on her and prayed. A few months later, the day came for her to have her surgery. As she went in to the hospital, they looked for the mass and instead of there being a mass, there was a baby in it’s place. What a miracle working God we serve! 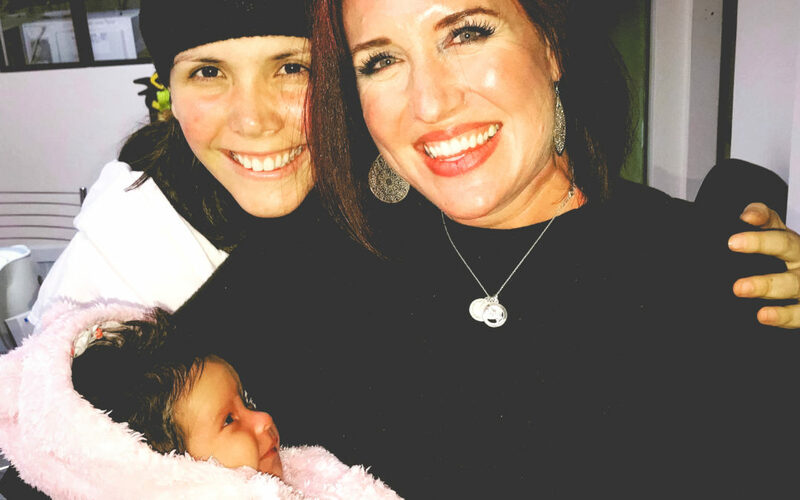 Last night, I got to go in and meet and hold that precious baby girl, Anelisse. There was so much joy and celebration in that moment. I got to hold a miracle and it was a special gift from the Lord. He loves his children. His promises are “yes and amen.” He is still about the business of working miracles. We left the church about 10:00 PM last night and returned to the hotel to rest and get ready for the church services this morning. We have expectant hearts to see all that God is going to do on this trip. We have already seen His fingerprints over our first day here. What an amazing and faithful God we serve! We can’t wait to share these days with you. We say it to people again and again. We are thirteen here but we represent hundreds of people in the United States who are praying, who have given, who are partnering with us as we are here. We are a very small part of a big whole who are a part of this trip. You are here with us in Spirit and we carry you in our hearts and share each one of you with the congregation here. The harvest we experience here is as much a part of your inheritance as it is ours. Your prayers are moving mountains and we are so grateful for each and every one of you.